Gaza: What's in the UN's new Gaza agreement? GAZA, JERUSALEM, DUBAI, 19 September 2014 (IRIN) - On 16 September the UN announced a new deal that is supposed to ease restrictions on the Gaza Strip. In his public statement on the day, Robert Serry, the UN envoy for the Middle East, gave few specific details about the deal but said it would "enable work at the scale required in the Strip, involving the private sector in Gaza and giving a lead role to the Palestinian Authority in the reconstruction effort." IRIN looks at the issues. Following the 50-day war between Israel and Hamas and other Islamist groups in Gaza, much of the enclave is in ruins. 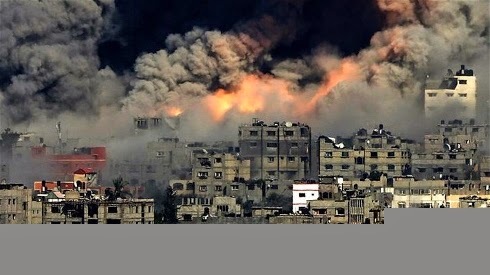 At least 18,000 homes were destroyed as Israel dropped thousands of bombs on the heavily populated area, while key infrastructure including power plants and water networks were also badly damaged. Rebuilding efforts are made even more challenging by a pre-existing blockade. Since 2007 Israel and Egypt have limited or banned many basic goods from entering the Strip. Among those that Israel restricts are fertilizers, cement, steel cables and even some fabrics. Tel Aviv defines such goods as "dual use" - meaning that while they are needed for the civilian population, they could also potentially be used by militant groups in attacks. With the catastrophic level of destruction and ongoing humanitarian crisis, rebuilding without easing the blockade is nearly impossible. A key housing group has estimated that without lifting the restrictions on cement and other dual-use goods, restoring Gaza just to the level it was before the war could take 20 years. As such, the UN, the Israeli government and the Palestinian Authority have reached a deal that seeks to increase access while aiming to assure Israel that none of the goods will fall into the hands of Hamas or other groups that it labels terrorists. Not all the terms have been ironed out yet and agreements on specifics - such as cement - have not been made public. Indeed both Israeli and Hamas officials IRIN spoke to were hesitant to talk about the exact terms of the deal. What is known so far is that there are two main areas of works that this applies to - UN projects and private Palestinian projects. The former have been subject to fewer restrictions in recent years, but a new deal has been agreed whereby the Israeli government will approve UN projects upon receipt of only basic information and their general locations. This, in theory, should speed up UN operations. The second category - Palestinian projects - is the more contentious issue. Under the new rules, Palestinian businesses trying to bring in "dual-use" goods must first register with a database run by the Palestinian government in the West Bank, not Gaza. This online database will register the import and transfer of items. There will be two different monitoring procedures - one for small-scale works such as people rebuilding their homes and another for larger private construction projects. Both of these involve UN monitoring teams overseeing the projects. What assurance does Israel have? Israel says it is concerned that previous "dual-use" materials have fallen into the hands of militants. Paul Hirschon, spokesperson for Israel's Foreign Ministry, told IRIN they believed Hamas and other groups had siphoned off aid money following previous rounds of violence in 2009 and 2012. "We do not want a repeat of what happened 2 or 6 years ago, where too much of it [funds, materials]. were diverted into terror," he said. "We need to ensure that the money that is poured into reconstructing Gaza is not simply put into Hamas's hands and from there converted from above ground to below ground." In theory there are a number of mechanisms to assuage the Israeli doubts. First of all, control of the Palestinian side of the crossings is supposed to be handed from Hamas to the Palestinian Authority (PA), which is based in the West Bank. Unlike Hamas, the PA has diplomatic relations with Israel. Likewise the online database should allow better tracking of goods once they enter Gaza. In theory this should help prevent them falling into the hands of Hamas or other armed groups. Thirdly, as outlined above, the UN monitoring teams are supposed to oversee projects, thereby ensuring that no goods go astray. Was Hamas consulted on this deal? It does not appear that Hamas, the Islamist party that runs the Gaza Strip, was explicitly involved in the agreement and the extent of the consultation with the group is unclear. Hamas Spokesperson Sami Abu Zuhri refused to discuss the extent of their involvement in the negotiations, saying only that the process should not damage the resistance - the commonly used phrased for the military opposition to Israel. "We welcome international and other efforts [for the] reconstruction of Gaza, and we urge [international powers] to push these efforts rapidly forward. Meanwhile, we reject any compromise related to our people's rights and resistance due to this matter," he said. Pushing through any deal without Hamas's support may be problematic. That depends. Serry was quick to stress that it was a "temporary mechanism" and had not replaced the ultimate goal of both Israel and Egypt lifting the blockade on Gaza. Talks on that matter are due to take place on 12 October in the Egyptian capital of Cairo, but analysts think that such an agreement is unlikely - at least in the short term. If no agreement is forthcoming in October then this agreement could be the best hope for improving access to Gaza.